"Time for the Obama administration to play another round of American's most fragrant game show." 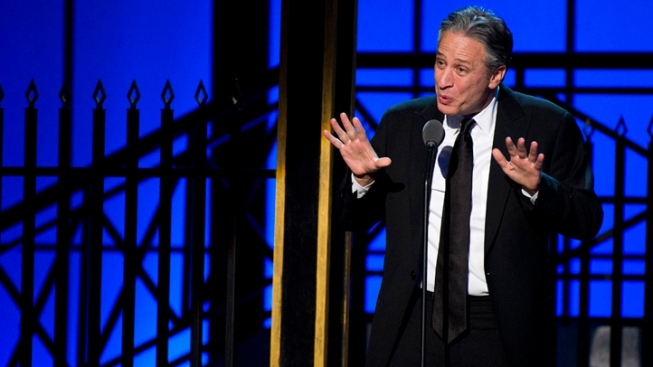 Jon Stewart appears onstage at The 2012 Comedy Awards. On Monday's edition of "The Daily Show," Jon Stewart mocked Democratic strategists and Obama re-election surrogates who tried to gloss over last week's dismal jobs report. In Stewart's words, the White House's reaction to news of stagnant economic recovery was just another round of "Polish That Turd." "The Obama team must find a way to spin this turd [the bad economy] into something positive," Stewart said. As a montage of Obama campaign officials and Democratic talking-heads offering partisan takes on the bleak employment numbers played, Stewart acted as a mock game show host—Bob Barker microphone included—and frequently cut away to clips of the late Richard Dawson hosting "Family Feud."